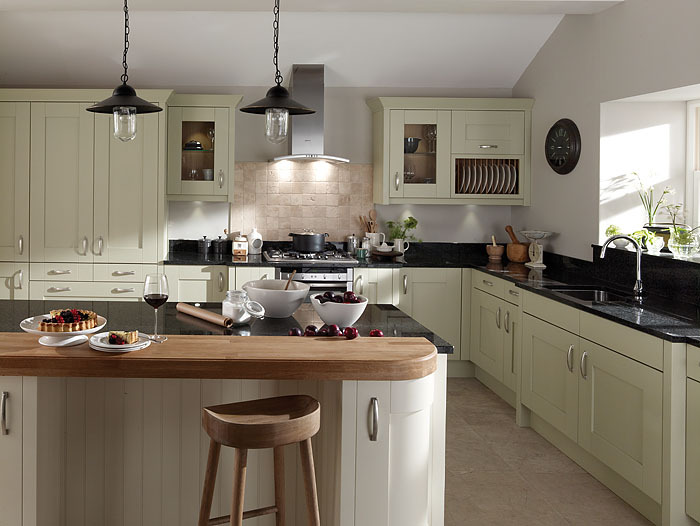 _Milbourne is a classic Shaker door with a chunky frame and a slightly textured finish. This kitchen incorporates an island and breakfast bar enhanced with black granite and extra thick oak worktop. Clear glazed feature doors are perfect for displaying your favourite pieces with a solid oak plate rack and a pantry offering further practical storage. __Kitchens Donegal, Kitchens Derry, Kitchens Tyrone, Kitchens Sligo, Kitchens Ireland, Cheap Kitchens, Irish Kitchens, Cash and Carry Kitchens, Riteprice Kitchens, kitchens online, modern kitchens, traditional kitchens, cheapest kitchens, really cheap kitchens, kitchens galway, kitchens mayo, kitchens dublin, diy kitchens, online kitchens, kitchens direct, kitchens, kitchens, kitchens, kitchens cork, kitchens tipperary, kitchens limerick, kitchens roscommon, kitchens armagh, kitchens northern ireland, cheap kitchens ireland, cheap kitchens northern ireland, cheaps kitchens donegal, cheap kitchens derry, flat pack kitchens, ready built kitchens, cheap kitchens sligo, cheap kitchens dublin, cheap kitchens galway, cheap kitchens mayo, cheap kitchens roscommons, cheap kitchens cork, b&q kitchens, ikea kitchens, homebase kitchens, b&q, ikea, homebase, kitchen world, cash and carry, cash&carry, cash & carry, riteprice, riteprice kitchens, cherrymore, wholesale kitchens, cherrymore kitchens, patterson kitchens, pattersons kitchens, crana joinery, northbrook design, paul james kitchens, donegal, derry, sligo, dublin, cork, galway, mayo, roscommon, kitchens, bedrooms, sliding wardrobes, sliderobes, gliderobes, cheap gliderobes, cheap sliding wardrobes direct, cheap sliderobs, designerobes, celebrity kitchens, famous kitchens, kitchens mags, designer kitchens, stevenson kitchens, kitcheneque, derry kitchens, donegal kitchens, inishowen kitchens, dublin kitchens, galway kitchens, mayo kitchens, tyrone kitchens.